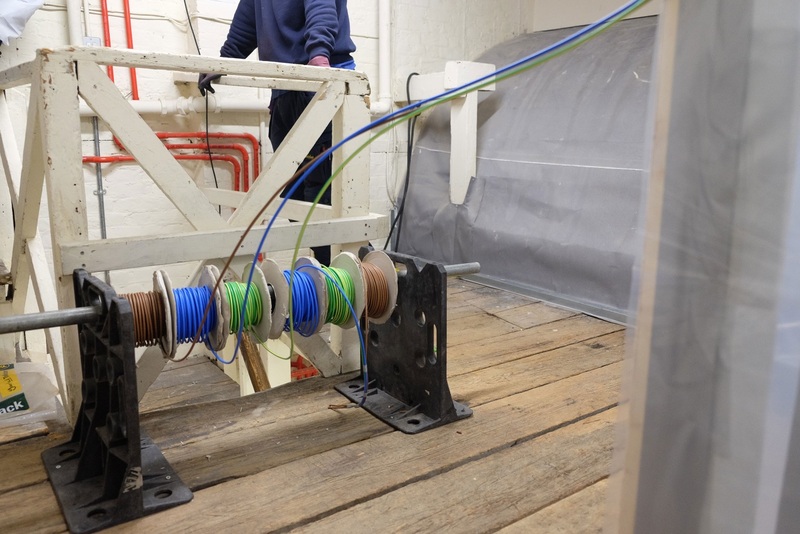 This short film shows the work being done to remove ageing and potentially dangerous electrical cabling from Buckingham Palace. So far, some 2km of Vulcanised Indian Rubber (VIR) cabling has been replaced – equivalent to the length of 40 Olympic sized swimming pools. Installed in the late 1940s, VIR becomes brittle with age and poses a fire risk. Removing the oldest electrical wiring is the first stage of a comprehensive Reservicing of Buckingham Palace. As set out in the Royal Trustees' Report of November 2016, elements of the Palace's plumbing, electrical cabling and heating have not been updated since shortly after the Second World War. These services are now in urgent need of a complete overhaul to prevent long-term damage to the building and its contents. As part of the ten-year project, electrical cabling, plumbing and heating will be replaced wing-by-wing, which means the Palace can remain fully operational. The updates will ensure Buckingham Palace is fit for purpose for the next 50 years and will also reduce the building's carbon footprint by 40% over time. Rewiring a landmark heritage building is an intricate task. In recent months electricians have worked in different occupied spaces of the Palace, to pull up cables through voids in the ceiling and the floorboards of the rooms above. The work began in a part of the Palace which includes The Queen's private apartments. This is where Her Majesty holds audiences during the year with senior figures from the UK, the Commonwealth and across the world. The VIR cabling in the apartments and the rooms below them was replaced last summer, while The Queen was in residence at Balmoral Castle. While carrying out the work, the reservicing team found pieces of history hidden beneath the floorboards, including old cigarette packets. Also discovered was a piece of the Evening Standard newspaper, which was published on 27 November 1889. Work is currently underway to remove a further 1.5km of VIR cabling from State Rooms including the Picture Gallery, Blue Drawing Room, Music Room, White Drawing Room, and Throne Room. Reservicing will continue throughout the entire Palace, starting with high priority works, and is due to be completed in 2027. Find out more about Reservicing here.